Weston Ranch will be hosting the annual JROTC Military Ball February 16th from 6 pm to 11 pm at the Stockton National Guard Armory 8010 South Airport Way. 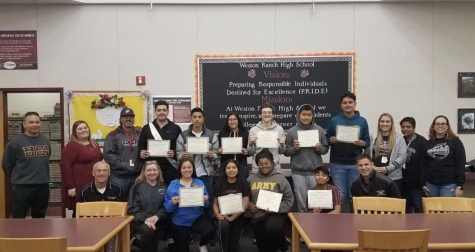 All Weston Ranch JROTC Cadets and their dates will be able to attend as well as couples from East Union, Manteca, Lathrop, Rippon, and Discovery Challenge. There will also be guests from administration and JROTC instructors present. Tickets for the event cost $30 per person and are being sold until February 14th. The money is due to the Senior Army Instructor (SAI) or (AI). For this formal event, male cadets must wear Class A uniforms with the standard blue shirt or a white dress shirt with a tie or a bowtie. Female cadets are to wear either their Class A uniforms or a gown/dress, which should be no more than 4 inches above knees. Non-JROTC guests must dress in semi-formal attire. Lieutenant Colonel Michael Cerezo said, “The evening will begin with the P.O.W. and M.I.A. ceremony, which will be followed by the Battalion Commander’s cake cutting ceremony. There will also be two guests that will be speaking, Lieutenant Colonel Salas of the Army ROTC professor, and Clark Burke, the Manteca Unified School District superintendent and a Lieutenant Colonel in the Army Reserve.” After these formalities, there will be a DJ and a free photo booth.